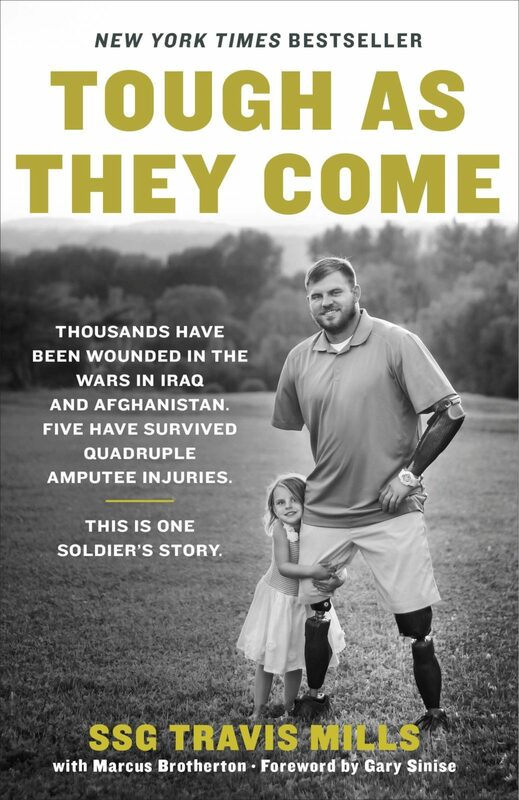 Tough As They Come Book - Travis Mills - Retired United States Army Staff Sergeant and recalibrated warrior. Thousands of soldiers die each year to defend their country. United States Army Staff Sergeant Travis Mills was sure that he would become another statistic when, during his third tour of duty in Afghanistan, he was caught in an IED blast, four days before his twenty-fifth birthday. Against all odds, he lived, but at a severe cost—Travis became one of only five soldiers from the wars in Afghanistan and Iraq to survive a quadruple amputation. Suddenly forced to reconcile with the fact that he no longer had arms or legs, Travis was faced with a future drastically different from the one he had imagined for himself. He would never again be able to lead his squad, hold his wife’s hand, or pick up his infant daughter. Travis inspires thousands every day with his remarkable journey. He doesn’t want to be thought of as wounded. Order your copy below from your favorite bookseller.